Want an example of how different our ancestors were a century ago? Try this: Imagine dentistry as a spectator sport. On a summer evening in 1913 Santa Rosa, an audience gathered on the corner of Courthouse Square to watch fifty people have a tooth pulled - or maybe it was just two people having all their teeth yanked. The local paper was not clear on the details except that it "attracted a large crowd who were interested in seeing the operations performed." The article in the Santa Rosa Republican is a rare description of the traveling exhibition by the "Painless Parker" dentist's office in San Francisco. Using a large Locomobile touring car - probably similar to this one - everything behind the front seat was custom rigged with "a platform on the rear large enough to accommodate a miniature dental office, with operating chair, instrument table, lights, etc." This was demonstration auto #6 (out of eight) prowling the state, and although "Painless Parker" himself was not in Santa Rosa that evening he was a real person and actually a dentist, although his profession disowned him. By 1913 Edgar Rudolph Randolph Parker (1872-1952) was a multimillionaire running a chain of dental offices on the West Coast but he began as a Brooklyn street dentist, drawing crowds with dancing girls and a brass band that played on cue whenever he "painlessly" ripped out some poor devil's tooth. When he came to California around 1908 he teamed with "Wizard Walton the Wonder Worker" and developed a traveling medicine show, complete with a parade where coins were tossed into the crowd, all leading up to an evening vaudeville performance that ended with a extravaganza of teeth pulling. Walton was a snake-oil huckster of the type that regularly visited Santa Rosa in that era, promising miracle cures in a bottle. A 1908 blurb promised, "gall stones are removed by the use of three doses of medicine in 24 hours without knife, blood or pain. Cancers cured permanently. No knife, blood or pain." Parker's secret to painless dentistry was "hydrocaine," a local anesthetic he claimed to have developed himself (a man in Chicago had trademarked that name as an anesthetic in 1899). Some of his ads specified it was not cocaine but "a purely vegetable product, harmless yet powerful enough to remove all fear of the dental chair." In a 1915 suit, two former employees demanded danages for alleged injuries to their "eyes, nerves, muscles and tissues" from administering the "poisonous drug." Whatever that stuff was, it certainly had no connection whatsoever to the fine medical product available with the same name today and whose manufacturers, distributors, and customers are noble people kind to their children and small pets. Please don't sue me. His New York Times obit noted he "often had his license revoked but for no great duration." Parker was the bane of the dental community, his fame coming just as they were scrabbling for legitimacy - medical doctors usually offered a dignified two-line ad in a newspaper's "professional" classifieds, yet dentists often ran large and garish display ads, promising to fix your bum teeth for less than the price of a cheap wool suit. Parker fought back in the press, arguing the "Dental Trust" was opposed to affordable dentistry. His display ads were often op/eds and he offered papers a serial, "Painless Parker, Outlaw: His Confessions" that ran to at least 87 (!) parts. He tried to get the state Board of Dental Examiners disbanded in California and Oregon, and in 1935 he sued a doctor for slander because of a speech to the California Dental Association saying the state needed a law "to control the advertising of charlatans, quacks and painless parkers." 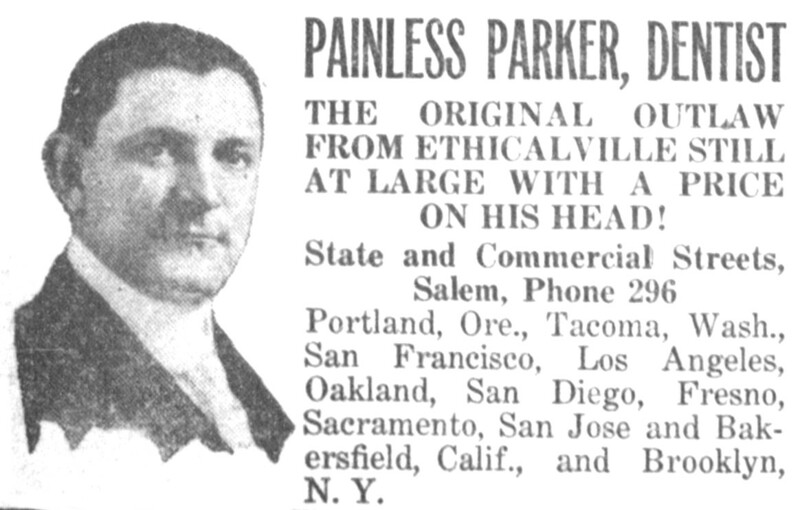 Most often he was hassled for using the word "painless" in his ads, forcing him to promote the "E. R. Parker System" instead. 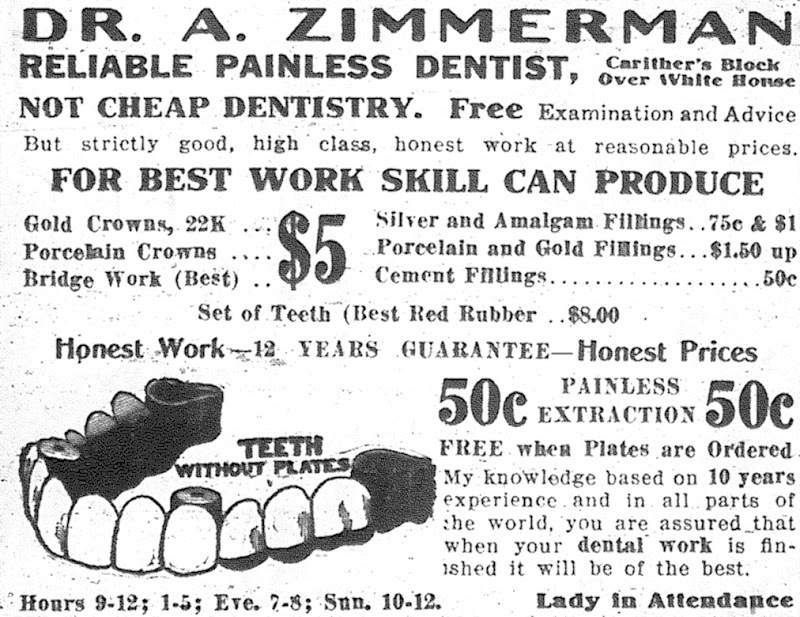 In 1915, his foes in California thought they finally had him beaten via passage of a state law requiring dentists to use their real name in ads. But in a true Believe-it-or-not! manner, he won by going to court that September and having his first name legally changed to "Painless." Many Santa Rosans were entertained last evening at the corner of Fourth street and Exchange Avenue by a demonstration of painless dentistry made by the Painless Parker demonstration car, number six, from San Francisco. A short lecture was given on the care of the teeth and then about fifty teeth were extracted free of charge. The car will be at the same corner again tonight and it is announced that all teeth will be taken out free of charge. 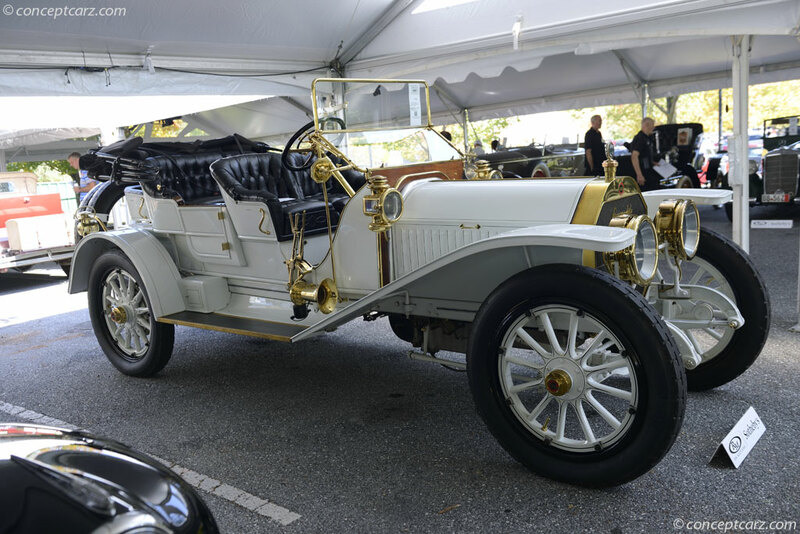 The car is a large Locomobile, and one of the eight that the Painless Parker institution has. It is splendily [sic] equipped for the work, having two seats in front and a platform on the rear large enough to accommodate a miniature dental office, with operating chair, instrument table, lights, etc., and attracted a large crowd who were interested in seeing the operations performed. Those who had teeth taken out stated that they felt no pain and several were extracted for people said that they had been broken off by other dentists in unsuccessful attempts to extract them. The Painless Parker institution is the largest dental concern in the world, having offices in several large cities stretching from Brooklyn, N.Y. to San Francisco. There are five offices in California: Los Angeles, San Diego, Bakersfield, Oakland and San Francisco. The San Francisco office is one of the three largest dental offices in the world, having twenty-two chairs. All of the operations by this concern are performed by a local anaesthetic [sic] originated nearly 25 years ago by Dr. Parker. The doctor makes his home in San Francisco where the general offices of the concern are located. He has a summer home in Marin county about ten miles from Fairfax on the Bolinas road. He is in New York now but his family is at the summer home. The car is in the charge of Drs. FitzGerald and Baird. It was a solemn and historic occasion, but all we remember about it today is that some bozos showed up and made fun of everybody. The event was the Fourth of July 1876 ceremonies held in Santa Rosa. "At an early hour the streets were thronged with carriages, horsemen and well dressed and happy looking men and women," reported the town's Sonoma Democrat. The parade formed on Third street; near the head was the Santa Rosa Brass Band and judges and dignitaries in carriages (including Bear Flag veterans with their famous flag). In the parade were also carts or displays representing local businesses, among them a wagon loaded with coal from the Taylor Mountain Coal Mine. "The procession marched through the principal streets which were gaily decorated with flags," the paper continued, before returning to the grandstand on Santa Rosa's plaza. The Squeedunks made their first appearance in Santa Rosa in 1876, on the occasion of the Centennial Independence Day. When the county’s honored “First Citizen,” General Mariano Vallejo, ended his long oration (in Spanish, with a translator) and the formal portion of the celebration drew to a close, a band of masked men in outrageous costumes seized the podium and began a mock-heroic “Oh Ration,” an extemporaneous and outrageous send-up of the venerable Vallejo’s speech. It's a fun story and often retold - except none of it happened quite that way. This was not the debut of the "Squeduncques" at a Santa Rosa Fourth of July celebration but at least their third appearance. Their "comical uniforms" were mentioned in a review of their 1874 showing so yeah, it's probably safe to assume they were also dressed up two years later, although nothing about it was mentioned. Those are quibbling points, tho. Look at our big brick depot, that we haven't built yet nor never will. Look at our grand school houses for the edification of the hoodlums of generations yet unborn. Look at all these and say are we not mighty in ourmightiness? Then let the proud eagle squawk; let the great American Jack bray and proclaim in stentorian tones "Erin go unum, E pluribus Bragh." Nor did General Vallejo even speak at the event. As described in the paper, he sat onstage as his speech was read by Charles E. Pickett, a well-known (and somewhat notorious) orator.1 The Sonoma Democrat didn't indicate whether it was in Spanish or English although it was likely the latter, as the paper commented the speech "was listened to with deep attention by all." The entire address in English appeared in the Democrat the following week. Even delivered in English by a popular orator the Vallejo speech was a real stemwinder, which probably added to the anticipation for the Squeedunks' part of the show - the paper reported before they appeared the large crowd "seemed by this time to have grown a thousand or two stronger." It's easy to understand their appeal; much of the irreverent humor still holds up today, 140 years later - and works particularly well if you can imagine Groucho Marx reading it. For some in the audience, however, their antics probably had a nostalgic appeal; the Squeedunks were part of a long American tradition on the East Coast better known as the "Fantastics." The Fantastics - sometimes "Fantasticals" - began in Colonial times (and can even be traced farther back to British mumming) were mainly young men dressing up, sometimes in women's clothes or wearing blackface while noisily mocking propriety and figures of authority. Think of it as trick-or-treating for adults, not children, and it happened at Thanksgiving or Christmas or any other holiday except Hallowe'en. Also: They wanted you to give them booze, not candy. More about the origins can be read here. Needless to say, our more sober ancestors were not approving of their young men carousing drunkenly in costumes four or five times a year. (Did I mention firing guns in the air was also a big part of the custom?) Apparently starting in the 1830s, restrictions began to be imposed limiting the partying to the Fourth of July and requiring the costumed revelers be enrolled in some sort of organized group. The earliest example of this I can find is an ad in the June 27, 1839 Baltimore Sun that calls for members of the "Eagle Fantastical Club" to attend a meeting for the upcoming parade. Fantastic processions burst out all over the town in unusual abundance and filled the popular eye with a panorama that looked like a crazy-quilt show grown crazy and filled the popular ear with the din of thumping drums and blaring trumpets. Thirty-six companies of fantastics had permits to march around making an uproar, and they did it with great success. Local statesmen went around.with the down-town paraders and helped them whoop things up. There were lots and lots of fantastics who hadn’t any permit, and who didn’t care either. They were the thousands and thousands of small boys who put on their sisters’ old dresses, smeared paint on their faces, pulled on red, yellow, brown, black, and indiscriminate wigs, and pranced round their own particular streets, without the least fear of police interference. The Squeedunk tradition continued in Sonoma county for decades, spreading to Sebastopol, Healdsburg, Cloverdale and other communities. The last great ballyhoo in Santa Rosa was in 1908 (see "SQUEEDUNKS ON PARADE") but attempts at revivals popped up occasionally in later years. How sad to have lost the custom of celebrating our old bums, lunch eaters, and scalawags. 1 Charles E. Pickett was then 56 years old and well known as an eccentric who claimed his profession as "philosopher." Despite a complete lack of legal training he was long a gadfly concerning the state supreme court, insisting the system of selecting judges was corrupt because the governor could appoint someone to fill a vacant seat until the end of the six year term of office. Thus a justice who was elected in 1870 and died or resigned the following year would be replaced with a politcal appointee until 1876, despite the opportunity for voters to choose a new justice in two general elections during that span of time. (Or at least, that's my reading of the confusing rules - see more details here.) In Pickett's view this meant the entire court should be impeached and as a new session began in August, 1874, he stormed the bench during opening ceremonies and took a seat himself. An uproar ensued and he was ejected, fined, and served over a year in jail for his unusual contempt of court. 2 Squeedunk (usually spelled Squedunk) came to be used as a joke town name, similar as Podunk, Skunktown and many others. Sometimes it was meant as the name of a place where backwoods yokels lived, othertimes it was just the name of a a hypothetical town. See: H. L. Mencken, The American Language, 1936. In the early 1870s, however, a squedunk was the name of a popular homemade noisemaker with a teeth-rattling sound created by drawing a violin bow or a waxed string on the rim of a tin can. Thus by calling themselves Squeedunks, the joke could have been either proclaiming themselves to be proudly "backwards country folk" or intending to be really, really annoying. Or both. Tbe Squeduncques, a distinguished band of imps, devils, patriotic hoodlums and screachers, will parade the streets of Santa Ross on the Fourth of July. Santa Rosa, July 4th, 1876. At the close of the oration Mayor Neblett announced that Gen. M. G. Vallejo had arrived on the morning of the fourth in Santa Rosa, having concluded to accept the invitation of the committee sent from Santa Rosa some days previously to invite him to deliver his historical address here, the managers of the Sonoma valley celebration having concluded to omit this feature from their published programme. The large audience hailed the General's advent [illegible line of microfilm] with much enthusiasm. His well prepared history of the early settlements of the north side of the bay of San Francisco, and other incidents, was read by Mr. Chas. E. Pickett of the city of San Francisco, a pioneer of 1842, was listened to with deep attention by all. At his close three cheers for the General were called for and loudly given. This instructive, graphic and exact historical sketch, with characteristic comments by the author, will appear in the weekly issue of the DEMOCRAT. Most potent, grave and reverend Seignor. Oh, thous noblest Roman of them all. Oh, ubiquitous chieftain of all patriotic emblems that adorn our American Eagle domain. Open your port-holes and hearken to the words that will immortalize you forever. For over nine million years it has been the custom of this lunch destroying band ever to recognize merit in the human family. Our four fathers, ants and sisters, were celebrated for a looseness in this disgusting familiarity of Freedom. For many sleepless nights we have watched the bursting character of your patriotic bosom. We have seen it swell--heave and pad out with a grandeur which few bosoms can ever expect to reach. For tendering us the use of this lumber pile, and for aiding us in the rescue of our hungry recesses, by the donation of the sum of one hundred dollars, accept the thanks of every member of this beer destroying gang. We are overflowing with gratitude but we can beer it all times. In order to make a proper showing of our inside feelings towards you, we present you with this beautiful sword. In other hands a club of this character would prove a very dangerous weapon. May you never entertain suicidal notions, for it won't do to get reckless in order to provide free rides for old bums. Take it--Hang it up in the cellar where it can never rust, nor become mortified by bad use. And when your beaming head shall have assumed the radiance of a white-wash bucket, and when telegraphing shall have been supplanted by the lightning speed of Fortson's street railroad, may you be rolled up in the emblems of eternal ease, surrounded by limburger cheese, and beer, and with this shining blade buckled to your majestic form may you march on to Fame and Glory, and find sweet repose in the happy hunting grounds of our Honorable Order. FELLOW SQUEDUNCQUES: One hundred years ago to-day the booming of patriotic cannon awaked from their heroic slumbers a band of ancient Squedunques. That Cannon has never ceased to boom from that day to the present. You hear it now, you have heard it all day. Why, Fellow Squedunques, is all this grand parade? Why all this vast assemblage of old bums, lunch eaters, and scalawags? Why all this tootin of horns banging of drums and squallin of "nest hiders?" It is, my fellows in iniqnity, to remind us of the fact that he who fit and run away has lived to fite another day. Yes, my Fellow Dunks, we have cause to squelch over our misdeeds. Aye, and in Santa Rosa, too. That does not find a rival here! I ask you, Squedunques, are we not great in our greatness? Compare us today with Santa Rosa one hundred years ago. Look at these sombrero oaks, which within the hundred years from little acorns grow. Look at these beautiful maidens who a hundred years ago were clad in homespun linsey and tow linen. How are they now? Wrapped in silk and satins from the Injins, bedecked with laces from Crapean and Deutchland adorned with gold and silver from Som Evaders, pinned back till the hump raises on their backs equal to the Camelias of Arabia. Look at our farms where a hundred years ago, notight was heard but the war whoop of the Digger and the wild screech of the Coyote, now blossoming and blooming with mustard and dog fennel. Look at our bankin institutions. There's the Anti Roses Bank where every Squedunque can borrow all he wants, if he leaves two dollars in the place of every one he borries. Then there's the Shavings Bank with millions in it saving up for the widders and orphins of deceased Squedunques, to be divided a hundred years from to-day. Then there's Long Pillars' Pharaoh bank that declares a divy every night, if you only copper the loser and go straight up on the winner. Ain't that improvement? Once more: Look at our great array of Policioners and County Deficients, who have entrusted us with their lives, their fortunes and their sacred honors. Don't they give up the jail keys valiantly and nobly; did they not a few weeks since with pistol and club arrest a powerful gang of marauders, put them in prison and save the life of an innocent criminal? Who cares for $1,500 reward? Then look at our defences! Don't we keep a cannon, always loaded full to the 'nuzzle, parading our streets from rosy morn to dewy eve, guarding the destinies of all good and worthy gin slingers? But this is not all, old bums! Look at our broad gouge railroads that President Don't-know-who has built clean through our county and down among the switches and hazel brush to Stumpville, with only $300,000 and the right of way to help him. Look at our big brick depot, that we haven't built yet nor never will. Look at our grand school houses for the edification of the hoodlums of generations yet unborn. Look at all these and say are we not mighty in ourmightiness? Then let the proud eagle squawk; let the great American Jack bray and proclaim in stentorian tones "Erin go unum, E pluribus Bragh." Happy proud Squedunques the lightning of tarantula juice has yielded to your animosity, let not the temptations of mint juleps and sherrey cobblers seduces you from the paths of sobriety. Fare you well. It was a momentous day: On February 24, 1854, the state legislature gathered in Benicia to vote on moving the state capitol to Sacramento. Three assemblyman stood and proposed to choose their own county seat instead - one wanted Marysville, another Stockton. James Bennett suggested Santa Rosa before the Yolo legislator rose and asked: "What county is Santa Rosa in?" See, Santa Rosa wasn't the Sonoma county seat at the time. In fact, Santa Rosa didn't really exist. It had only two houses and five little businesses, including a tavern. Yet despite its drawback of being almost non-existent, Bennett and other men were about to make it the centerpiece of the county. When Santa Rosa was celebrating the Centennial Fourth of July in 1876, an article about Santa Rosa's founding appeared in the local Sonoma Democrat newspaper. It was unsigned but was clearly written by someone who was here during 1851-1854, which were the years being described. It's a key reference; traces of it pop up in every regional history. But aside from a Gaye LeBaron column published four decades ago, the bulk of the piece hasn't appeared anywhere over the last 140 years. It can be found transcribed below. That article covered the birth of Santa Rosa, death of Franklin (a village near the Carrillo adobe) and the campaign to capture the county seat. It was surprisingly slim on the particulars of those notable events. Instead, the value of this piece lies in its first-hand descriptions - such as Squire Coulter rolling his building from Franklin to Santa Rosa on wheels. Other buildings, including the Baptist church, likewise rolled away from Franklin over the following months, in what must have been a very odd and very slow procession. The author also described the Carrillo homestead as the main commercial center north of the town of Sonoma, a "lively spot" where "almost every day pack trains and wagons from the Russian river and the neighboring country surrounded the old adobe." Mostly the item described who was there and what they did. Personally, I'm not much interested in who was the first blacksmith in Santa Rosa and where his shop stood, but details of that sort can give genealogists a case of the vapors. For more information on the people mentioned there - including correct/alternate spelling of some names - refer to pages 20-22 of "Santa Rosa: A Nineteenth Century Town" by LeBaron et. al. Left unanswered in the article about the early 1850s - and not discussed in any local history that chronicles those years - was a key question: Why did Santa Rosa come to exist? But events leading up to the vote are sketchy. That's not particularly surprising; much of California history between 1850-1855 is full of gaps. Even in Sonoma county it's hard to peg down what was happening year to year. There's no doubt, however, that nearly everyone, Californio or American, rich or poor, was fretful over keeping their property. Should you build a cabin and plant crops if you could be kicked out before the harvest? Would the ranch supporting your family be taken away by the government, or taken over by squatters? Once California became a state, no one - no one - was happy with the situation over Spanish/Mexican land grants. In theory, anyone who had land under Mexico simply had to provide documentation to claim ownership under statehood. In practice, the system set up by the U.S. to settle ownership issues was the worst possible, leading some properties to remain in limbo for over twenty years. The Yulupa rancho east of Cotati was a good example; although Jasper O'Farrell had surveyed the surrounding ranchos, Yulupa specifically had no survey of its own, so the government rejected the claim in 1854. Appealed to federal District Court, the claim was approved in 1857. Two years later it was rejected again, this time by the U.S. Supreme Court. Not until 1865 was that large chunk of central Sonoma county (about 25 square miles) legally available for ownership. Squatters, of course, had been living and farming on that land for years. Some settlers leased acreage or had other arrangements with the grant holders, but others squatted without permission. Twice confrontations with armed bands of squatters nearly came to shooting wars - near Healdsburg where a deputy sheriff was killed, and near Bodega where the rancho owner recruited a gang of toughs from San Francisco in an attempt to drive them off. The state legislature fielded various proposals to mollify settlers, such as considering giving then 160 or 320 acres of public land somewhere else in the state or requiring grant holders to pay evicted squatters for what they had "cultivated or improved," the value to be set by a jury specifically composed of other settlers. Meanwhile, the Mexican grantholders - usually land-rich but cash-poor - were being bled dry by legal fees defending their claim. To raise funds they usually sold off parts of the rancho to settlers or speculators, even though those sales would be invalid if the courts didn't eventually validate the Mexican grant. Did I mention no one was happy with the situation? The first intimation we had of the people's desire to move the county seat from Sonoma to Santa Rosa was through the legislative proceedings of March 28, which inform us that a bill had been introduced and passed for that purpose. From what source did our representatives derive the information that a change was demanded by our people? In the name of a large body of their constituents we protest against the measure as premature, unauthorized and impolitic. The county cannot even repair the miserable building, and the only one it possesses; how then can it bear the expense of erecting new ones? That "miserable building" was the county courthouse, and had earlier been condemned by a grand jury, which called it "an old dilapidated adobe of small dimensions, in part roofless and unfit for a cattle shed." They say it had cost $9,000, of which $3,000 had been paid and $6,000 was still claimed. The town paper - unaware that a plot was afoot to move the county seat - commented at the time, "the old court-house is about being deserted, and high time it should be, unless our worthy officers of the law would run the risk of being crushed beneath a mass of mud and shingles, for we really believe it will cave in the next heavy rain." Clearly some measures had to be taken by the county to provide a useable courthouse, but a seat of government usually doesn't pack up whenever a building needs repairs. Not only did Bennett's "Act to locate the county seat of Sonoma anew" propose exactly that, but its language was crafted to specifically fit Santa Rosa: "...said location shall be as near the geographical centre of the valley portion, or agricultural portion of said county, as practicable." But the county residents, I believe, saw it as something more than just voting on moving the courthouse to Santa Rosa - and the tipoff is that part of the Act regarding the importance of the new seat being at the center of the county's agricultural region. There is clearly no need for the county seat to be in the middle of the farmland, but in 1854 Sonoma county, that meant being at the center of local squatter activity. It was, essentially, declaring the county to be welcoming to squatters while being also a gesture of defiance against both state and nation for their failure to "solve" the land grant problems to the settler's liking. That is, I'll grant, just my reading of events. We don't know the content of speeches made at the Fourth of July BBQ, which probably declared what Bennett and others were really after. But "up-county" (as the Sonoma paper called areas north of them) certainly had more small farmers likely to be very upset about the indecisive, snail-paced processing of the grant claims, and the horseback ride to the courthouse in Sonoma took at least two hours, each way. Aside from a couple of tiny districts, Sonoma and Petaluma were the only places that voted against the move. And moving the county seat was only the first of Sonoma county's many contrarian positions in that era. In the 1855 elections there was a local "settler's ticket" where every single candidate won. The county remained out of step with the rest of the state a few years later as the Civil War began, being the only most significant county in California that never voted for Lincoln. And in the center of it all was Santa Rosa, a town created from nothing. Which brings us back to the big question: Why did Santa Rosa come to exist? Towns usually evolved organically around something like a trading post, a riverport, a stagecoach or railroad stop. Maybe there was an adjacent swift-moving waterway to power a mill or factory; maybe there was a mine which employs lots of miners. The only apparent advantage of Santa Rosa's location was that it was at a crossroads, although to date that had not provided enough incentive for anyone to build a house or store there. Ignored in every published history, however, was the significance of this: The town was pressed tightly against the side of a very old Pomo village. 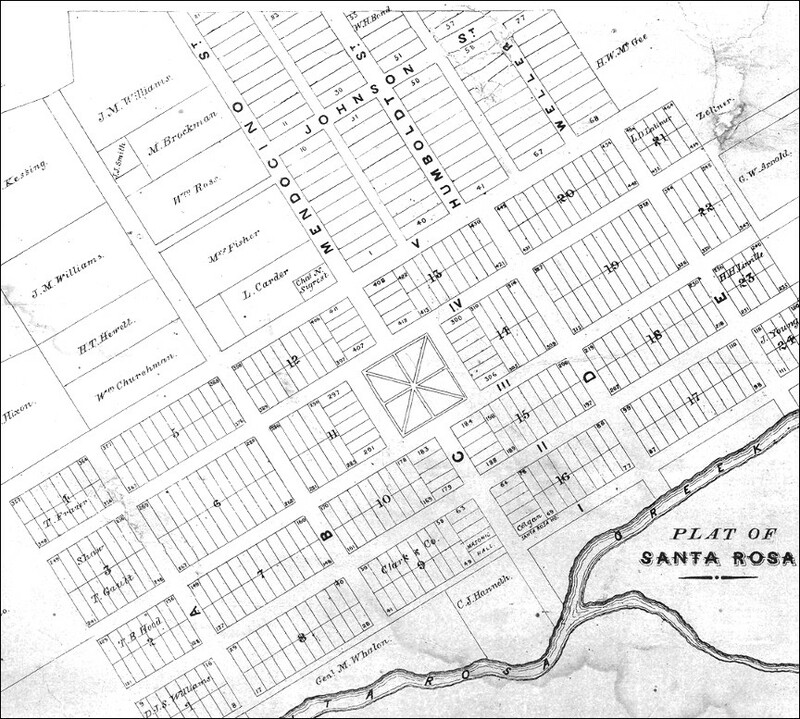 Perhaps Santa Rosa was at that particular spot in order to exploit those Indians who remained as laborers; over their centuries of living there the Pomo would have developed the best possible ways to access the confluence of Matanzas Creek and Santa Rosa Creek, which certainly would be an advantage to residents of the new town. Today, sadly, Kabetciuwa has been completely obliterated by Santa Rosa's city hall complex and the federal building. Our squatter forefathers would be so proud of how the city they created just took a place over without so much as a look back. In 1852, John Bailiff built on the bank of Santa Rosa creek, for Julio Carrillo, the house now owned and occupied by James P. Clark. Soon after, Achilles Richardson built a store and residence between the Carrillo house and the creek near where the iron bridge now is. This house was afterwards burned. Mrs. Valley built a dwelling house on the corner of second and D streets. The old Masonic Hall, was built in the fall of 1853. E. P. Colgan who had been at the old adobe keeping a public house, moved to Santa Rosa, and rented the lower part of the Masonic Hall, and commenced building a house on the opposite side of the street which was the first hotel and was known as the Santa Rosa House. Ball moved down from Franklin and built a blacksmith on Second street now used as a barn next to the lot of John Richards, and soon after built a dwelling on the south side of Second street, just east of Main or C street. Hahman, Harman and Hoen, in the spring of 1854 built a store on the corner of C and Second street and moved to Santa Rosa in July of that year. The building now occupied by Moxon's variety store. Be that as it may they won the fight, and in the fall of 1854 the county offices with the archives were transfered to the new capital. The first court convened in Julio Carrillo's house. Soon after, a temporary court-house was built where Ringo's grocery store now stands, on Fourth street, opposite the north-east corner of the plaza. After the election Franklin town was removed to Santa Rosa. S. T. Coulter hauled his building here on wheels, set it down where the Santa Rosa Savings bank stands, purchasing there 80 feet front for the sum of one dollar front foot--$80 for two lots. The Baptist church came soon after and was re-located on Third street, near D. A few years ago it was turned broadside to the street and converted into two tennement [sic] houses. Henry Beaver was the first blacksmith in Santa Rosa. His shop was near the bridge were Bill Smith's shop now stands, on the east side of C street. Beaver purchased two acres of land and built a residence on the place now owned by Capt. J. M. Williams, on Mendocino street, opposite the Episcopal church. Julio Carrillo started the first livery stable. The Eureka Hotel was built on the site of the Kessing Hotel by J. M. Case and W. R. O. Howell. Obe Ripito and Jim Wilson built a livery stable where the Grand Hotel now stands, on the south-east corner of Third and C streets. The first public school was kept by W. M. Williamson, now a resident of the Navagator Islands, [sic - now known as Samoan Islands] and a former subject of Ex King Steinberger of Samoa. The first bridge over Santa Rosa creek was built by Charles White. The first church built in the town was the Christian Church, which stood on the corner of B and Fourth streets where the Occidental Hotel now stands. Two flourishing colleges have been founded. The city limits embrace an area of one and a half miles square. There are more than 1,000 houses and there is a rapid growth in material prosperity as well as in population. The future we will not predict. We are thankful that our lot is cast in a land so fair, a climate so salubrious, a soil so fruitful that it laughs with plenty if "tickled with a hoe." A zealous priest, Father Amoroso, gave the stream and valley the name of Santa Rosa--in honor of Santa Rosa de Lima. The 26th day of August is her festival, and it must have been on that day that the good father discovered and baptized the stream.